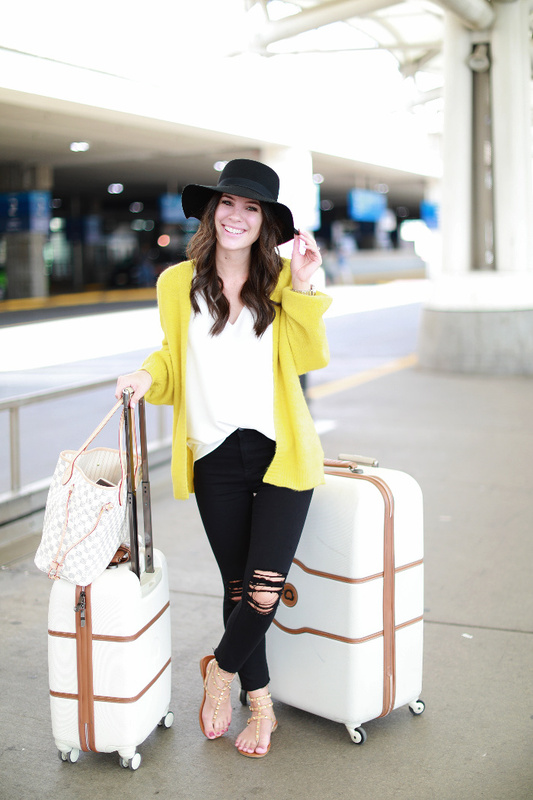 I have traveled with bags big and small and I'm team big all the way! To keep things organized I like to get little bags (I just got this one for my friend's birthday & it is so cute!) to store different items- one for makeup, one for my glasses/contacts, one for the extras (gum, mints, floss, medications, etc). Big bags tend to become a bottomless pit, so I try to have a bag for everything that way I know where to find what I need. Also, it makes switching bags so much easier. If I'm traveling with a passport, I like to carry a case like this because I can fit important travel documents as well as my passport and it's easier to find in my purse. I wish this one had the extra slots because it's SO cute but you can totally just fold plane tickets and such and stick it inside. One quick thing I want to mention, is go with a shoulder bag. I have used arm totes and they can get so heavy after a while. I found a site that you can get my bag discounted here. And here is anther tote I am LOVING that's less than $50. It's the perfect size & comes with an extra wristlet. Unless we're traveling where it's freezing cold where I take a coat with me, I prefer traveling with a cardigan. You can take it off if you get too hot, or keep it on when it gets chilly. 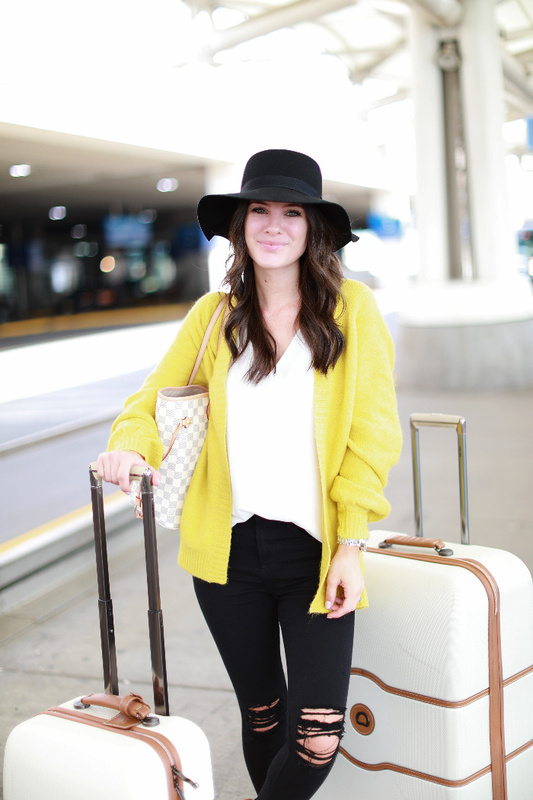 I like to travel with a lighter cardigan even in the summer time because plane rides can get so cold. For this trip, once we landed to Colorado, it was pretty hot out so I traded my pants for shorts and was good to go for the day. I ended up taking my cardigan off too but had it for later that night when it got colder. They're just so easy and versatile. If you don't end up needing it on the flight, at least you have yourself a pillow lol! This yellow cardigan is probably my favorite recent purchase. I am obsessed and it is the softest thing ever! It makes such a great cardigan for fall and is $45 with free shipping and returns, but if you get it you HAVE to tell me how much you love it! Seriously best cardigan ever! I am wearing a size 4 for reference. I almost always pack a year-round no matter what trip we go on. For our trip to New York/Colorado I realized I forgot my hat at home when we got to the airport :( So I had to get one while in New York because I hate traveling without it and found this one which was only $24 and I love it. Hats are forgiving on days you don't feel like doing your hair or traveling of course where the last thing I want to do on a 5am wake up call is touch up this weave lol! Also, it is a lifesaver on the flight because I tilt it down to cover my face & block out any light. I'm always sleep deprived before we travel so I knock out as soon as we hit the plane. On our way back home, we took a red-eye flight and the person in front of us had his light on the entire flight. I was so happy I wore my hat because it stayed nice and dark and was able to sleep majority of the flight. I have traveled in flats, sandals, and heels and with so much walking, I'm all down for a comfy shoe! I look back to last year when I traveled in heels to Europe and shake my head haha! (Here's the outfit I'm talking about if you want to see or if you just want a little chuckle at an old blog post lol). They were comfortable heels and I took them off as soon as we hit the plane, so my feet didn't hurt but I don't know why it still makes me LOL! Probably because now, I can't imagine traveling in heels. At least not on a trip across the world lol! From New York to Colorado, I wore these sandals. They are beyond comfortable, but they do take a minute to take on and off at the security line. It was hot in Colorado when we landed so they were convenient, but I traveled in these blush loafers to New York and they are hands down my favorite shoe I have ever traveled in and super easy to slip on and off. They're currently 60% off and come in grey too. I can't say enough good thins about them! They do give in so stick to your true size. I would love to hear what you all can't travel without in the comments below :) Hope you all have a great weekend!